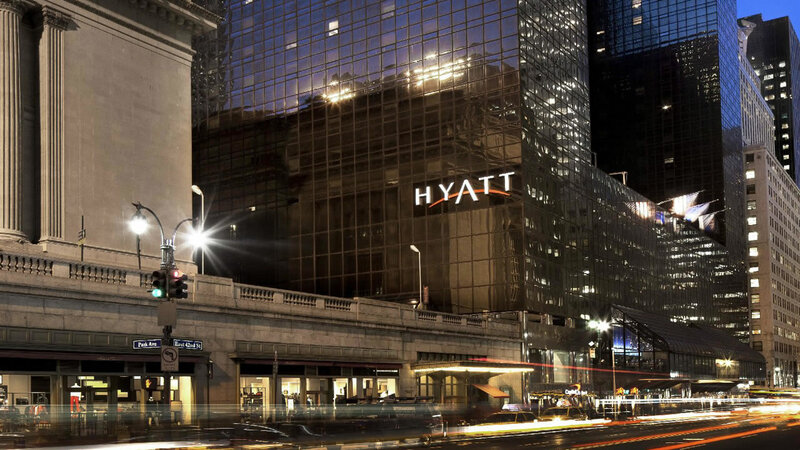 Have you ever wondered why the Grand Hyatt Hotel‘s Midtown branch was allowed to build a restaurant out and above the sidewalk on 42nd Street? It’s a unique feature for New York City, which has historically guarded its public space from encroachment by private development. But the story of this space is an illustrative tale of development in New York. 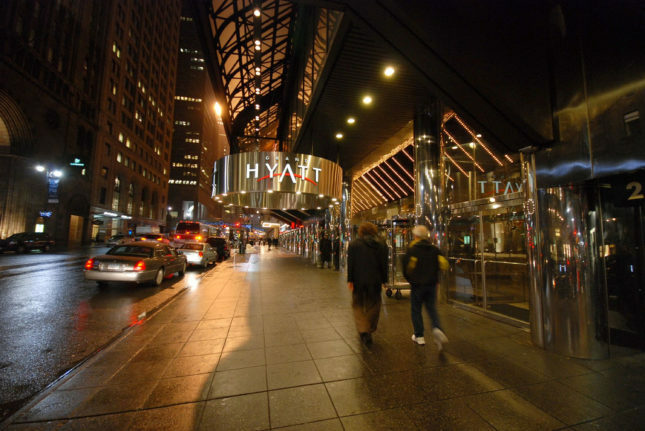 The hotel is famously Donald Trump‘s first project (done with the Hyatt Hotel) in Manhattan and its design presages the Trumpian aesthetic that we see in today’s streetscape. In 1976 Trump was able to convince the city’s now-defunct Board Of Estimate to approve a plan to rebuild the 1919 Beaux Arts brick-and-stone-detailed Warren and Wetmore–designed Commodore Hotel. The cantilevered restaurant was part of that plan. The new design for the hotel was done by Gruzen and Partners with Der Scutt as consulting architect. Rather than tear down the Commodore’s brick facade, the architects simply sheathed its walls with a skin of bronze-colored glass set in a grid of dark anodized aluminum. Peter Sampton of the Gruzen office remembered in a recent conversation that when the architects first met with Trump he said “I hate granite. I like shiny and want glass and aluminum.” That was it for the generic, but more appropriate, brick-and-stone facade developed by Warren and Wetmore. For the interior, Trump told the architects he wanted a “big atrium.” But according to Sampton, it turned out it was impossible to create a typical Hyatt central atrium because of the 1919 structure’s multiple columns. Instead of a vertical atrium, the architects proposed a grand horizontal lobby. Trump loved the idea because “he was getting something for free.” The restaurant was a spatial extension of this concept and was even pitched as a hotel sign to get around the requirement of building over a public sidewalk. The interior of the hotel went through a renovation in 2011 by Bentel & Bentel—commissioned after the Hyatt Hotel had a falling-out with Trump—but the building extension naturally remains. In fact, this cantilevered sign-slash-restaurant was possible because the developers proposed it at the height of New York’s fiscal crisis. The mayor at the time, Abe Beame, thought it was important to realize this project and he allowed the private space to span the public one. It was a valuable lesson for Trump on how to deal with a public entity and one that he has continued to learn—and earn—from.